Since the prototype object for an object can also have a prototype object, every object has something called a prototype chain. Whenever you attempt to read a property, each link in the chain is checked for the property. If the property is not found in the object’s prototype chain, then the property value undefined is returned. Prototype Inheritance is illustrated by Figure 1. In Figure 1, there is an object with two prototype objects in its prototype chain (a prototype chain is terminated with a Null value). The object itself (located at the bottom of the figure) has two properties named PropA and PropB. This object’s first prototype object, Prototype 1, has one property named PropC. Finally, Prototype 1 also has a prototype object named Prototype 2. Prototype 2 has two properties named PropD and PropA. When reading the value of a property from the object, the entire prototype chain is used to retrieve the value of the property. For example, if you attempt to read the value of PropC, the value of the property is retrieved from Prototype 1. Notice that a prototype chain can contain duplicate properties. 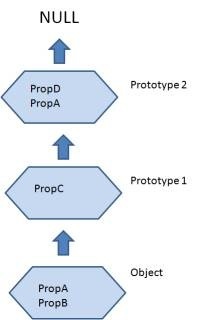 In Figure 1, PropA is included twice: as a property of the original object and as a property of the Prototype 2 object. Prototype chains use a first match algorithm. Therefore, when reading the value of PropA, the Prototype 2 object is ignored (lower objects in a chain can mask properties of higher objects in the chain). Here’s what is a little confusing about the way that Prototype Inheritance works. You don’t specify the prototype object for an object itself. Instead, you specify the prototype object with an object’s constructor function. This point is clearer with a sample of Prototype Inheritance in hand. Listing 1 contains two objects: BaseControl and TreeViewControl. These classes represent visual controls (widgets) that might be used in a web page. The TreeViewControl object inherits from the BaseControl object. 20:  alert(treeView.PropA); // displays "TreeViewControl PropA"
21:  alert(treeView.PropB); // displays "BaseControl PropB"
In Listing 1, two object constructor functions named BaseControl and TreeViewControl are created. Next, an instance of BaseControl is created and assigned to the TreeViewControl function’s prototype property. Assigning an object to the Prototype property creates the prototype relationship between the BaseControl and TreeViewControl functions/objects. When these steps are completed, you have a new object named treeView that has one property named PropA. In addition, the treeView object has an internal [[Prototype]] property that points to an instance of the BaseControl object. When you read a property from an object, the internal [[Prototype]] property is read to find a particular object’s prototype. Therefore, when you read treeView.PropB, the value “BaseControl PropB” is returned from the treeView prototype chain. This method does something really simple: it copies all of the properties from a source object into a destination object. 20:  alert(treeView.PropA); // displays "BaseControl PropA"
In Listing 4, the Object.extend() method is used to copy all of the properties of the BaseControl object into the TreeViewControl object. Next, the extend method is called a second time to create a new copy of the TreeView object. This modified version of Object.extend() won’t overwrite existing properties in the “derived” object. 25:  treeView2.MethodA(); // displays "Hello"
In Listing 6, BaseControl has two properties that represent Object types rather than value types. For example, PropB represents an Array. Since an Array is an Object type, every object extended with the BaseControl will share the same reference to the very same Array. Adding an item to treeView1.PropB also adds the item to treeView2.PropB. The fact that Object.extend creates a shallow rather than a deep clone is both a good and a bad thing. On the one hand, from the point of view of memory consumption, it is a good thing. On the other hand, if you don’t know what you are doing, then you might shoot yourself in the foot. 21:  alert(treeView.PropA); // displays "TreeViewControl PropA"
22:  alert(treeView.PropB); // displays "BaseControl PropB"
Of all of the methods of constructing objects described in this blog entry, I find this method the most intuitive and easy to use. The BaseControl function is assigned to a property of the TreeViewControl constructor function. Next, the base constructor function is called. That’s it. The point of this code is to call the BaseControl constructor with the right value for the this keyword. When the BaseControl() function is called, you want the keyword this to refer to the current object being built by the TreeViewControl constructor function. The method used in this last code sample is the shortest way of building objects from existing objects that I know. When BaseControl.apply(this) is called, the BaseControl function is called with the current object as the value for the BaseControl function’s this keyword. Therefore, the BaseControl function ends up decorating the current object with the PropA and PropB properties. The chief advantage of Prototype Inheritance is saving memory. When you use Prototype Inheritance, you are not creating copies of object properties. Instead, Prototype Inheritance enables you to specify relationships between distinct objects with distinct sets of properties. If you are working with thousands of objects, then saving memory might really matter to you. The advantage of the Xerox method is performance. Following a prototype chain to resolve a property takes time. When using the Xerox method, on the other hand, every property of an object is a local property. An object’s prototype chain is never used. One other advantage of the Xerox method is flexibility. The Xerox method supports multiple inheritance. If you want to derive a TreeViewControl from both a BaseControl and a BaseDataBoundControl, then you can do this with the Xerox method but not with the Prototype Inheritance method. When building new objects out of existing objects using ASP.NET AJAX, you use some of the features of Prototype Inheritance and some of the features of the Xerox method. Let's look at a code sample. 26:  alert(treeView.PropA); // displays "TreeViewControl PropA"
27:  alert(treeView.PropB); // displays "BaseControl PropB"
First, the registerClass() method is called for the BaseControl constructor function. Next, the method is called for the TreeViewControl constructor function. When the method is called for the TreeViewContructor function, a second parameter is passed that represents the TreeViewControl’s base class. There is one other important line of code that you need to notice in Listing 2. Notice that TreeViewControl.initializeBase() is called in the TreeViewControl constructor function. If you don’t call this method, then the prototype relationship between BaseControl and TreeViewControl will never be created. One last thing that you should notice about Listing 2. Notice that the object properties are not defined within the constructor functions. For example, PropA is not defined in the BaseControl constructor function. Instead, PropA is defined with the BaseControl.prototype object. This is a requirement when using prototype inheritance with ASP.NET AJAX. If you define the properties within an object’s constructor function, then the prototype chain never comes into play. As I mentioned before, the ASP.NET AJAX Framework uses both Prototype Inheritance and Xerox Inheritance. On the one hand, ASP.NET AJAX uses Prototype Inheritance. Every instance of a particular class (such as the TreeViewControl class) shares the same prototype. 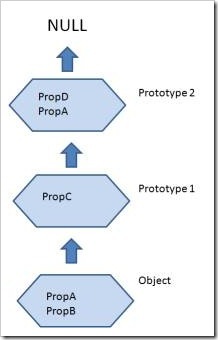 The prototype and not the object instances have the PropA and PropB method. Memory is saved since these properties do not need to be copied to each and every instance of a TreeViewControl. On the other hand, ASP.NET AJAX uses Xerox Inheritance. When the ASP.NET AJAX initializeBase() method is called, the prototype chain is collapsed. All of the properties of each prototype object higher in the chain are copied lower in the chain. Presumably, the ASP.NET AJAX framework collapses the prototype chain to improve performance so that the chain does not need to be climbed when reading the value of object properties.